Renewables are on the rise in the U.S., with wind and solar representing the fastest growing energy technologies—even outpacing new natural gas capacity development in recent years. But only some electricity grids are well positioned to capture the benefits of low-cost wind and solar. The electricity grids of the Western U.S. are home to major electricity innovation—as well as major grid challenges. For example, as companies increasingly look to buy renewable energy to meet ambitious sustainability targets, many prefer to purchase renewable energy only in the same electricity markets in which they operate. So far, this has proven difficult, if not impossible, for companies located in the West due to complex regulatory and market structures. According to some advocates, a fix for these barriers is available today: simply merge the Western electricity markets. A fully integrated Western electricity grid was discussed this past summer at a workshop in San Francisco hosted by Rocky Mountain Institute’s Business Renewables Center (BRC) and the Business Council on Climate Change (BC3). At the workshop, some of California’s most important companies, renewable energy developers, and utilities discussed the state of the California electricity market as it pertains to California businesses. One key takeaway: the possibility of a fully integrated Western electricity grid would have important implications for California renewable energy buyers. To understand why an expanded market makes sense, it’s worth exploring how the grid is set up today. The United States is physically split into three separate grids: Eastern, Texas, and Western. The Eastern interconnect, encompassing most states to the east of the Rocky Mountains, is primarily managed by four independent system operators (ISOs) (outside of the Southeast). The Texas market is also controlled by an independent ISO. These ISOs in the East and in Texas oversee competitive wholesale electricity markets that allow companies to sign virtual power purchase agreements (VPPAs) and sell renewable energy into the grid, which supports the development of new wind and solar capacity. The West, however, still has a touch of the Wild West—at least in regards to its electricity grid, which is managed by 38 independent organizations that balance the electricity running through their respective areas. These independent balancing authorities lack the competitive markets that allow companies to sign VPPAs directly with a developer. This restriction has prevented the proliferation of corporate renewable energy deals in the West, despite this region being home to many suitable locations for renewable energy, such as wind-rich Wyoming and solar-rich Arizona. As a result, companies seeking to provide renewable energy for their operations in the West have been forced to negotiate one-on-one deals with utilities to create a new renewable energy tariff class. This process is time-consuming, inefficient, and only open to influential companies (although once a tariff gets created, any commercial customer can access it). One exception to the complex, closed market structures in the West is the California Independent System Operator (CAISO), which has seen a flurry of solar and wind projects developed over the last decade. In fact, in 2017, CAISO experienced moments with over 50 percent renewable energy production on its grid. But CAISO is not without its own challenges. Corporate deals within CAISO have, ironically, been hampered by the state’s aggressive renewable energy targets. Specifically, while the California state renewable energy goals have led to a surge in renewable generation development, the glut of new renewables is leading to reduced electricity prices in the market—especially wholesale prices during daytime hours when the sun is shining. These low prices have made signing a VPPA less valuable from the perspective of a company looking to enable more build-out of solar and wind projects. Low prices have also led to solar and wind farms temporarily shutting down at moments of oversupply (this is known as curtailment). At the time of writing, over 330,000 MWh had been curtailed; this foregone electricity could have powered roughly 30,000 homes for a year. Ultimately, these issues have made it difficult for companies to find deals that are economical despite the declining cost of wind and solar generation. For more information on how these transactions work, visit our previous blog here. One solution to both the complexity challenges in the Western grid and the oversupply of renewables in CAISO is for California to expand CAISO to encompass much of the Western region. An expanded, regional ISO would enable corporate transactions for renewable energy in two ways: 1) it would open up the West to corporate renewable energy transactions in locations currently without market access; and 2) it could improve the economics of corporate transactions in California by growing the demand for, and therefore the value of, California wind and solar power. Regarding the first point, expanding the CAISO market to wind- and solar-rich regions such as Wyoming and Arizona would allow companies to find more market opportunities in the West. This expanded opportunity has two primary benefits. First, companies with facilities across the region could source local renewable energy, thereby supporting local jobs and economic development. Second, companies could potentially buy this electricity at a cheaper price. For example, Wyoming wind farms would generate energy at roughly half the cost of comparable facilities in California, because of Wyoming’s lower land costs and higher wind speeds. These cost savings could help companies sign more economic transactions. Moreover, expanding the market might also benefit wind and solar projects located in California. 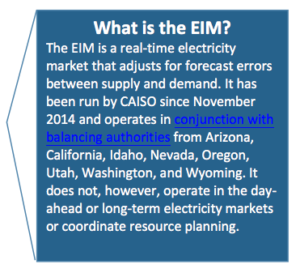 If CAISO were to encompass the surrounding states, additional electricity produced in California during oversupply hours could be exported to neighboring states instead of being curtailed. An increase in demand would also increase the value of this electricity, which would improve the economics of corporate transactions. While creating a region-wide ISO may sound like a daunting task, some important intermediate steps are already under way. 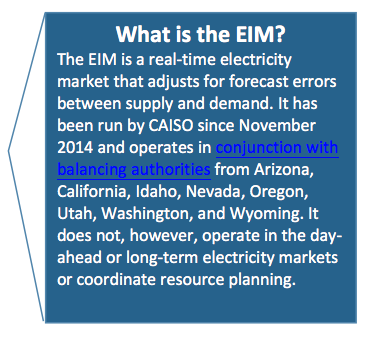 Since 2013, CAISO has organized a region-wide energy-trading scheme known as the Energy Imbalance Market (EIM). The EIM has produced $255 million in benefits since November 2014; much of this value has come from the EIM’s ability to divert otherwise-curtailed cheap renewable energy to participating states, in lieu of those states running more expensive natural gas or coal units. However, the EIM is an incomplete fix; transitioning to a fully integrated Western ISO would further build on these benefits by providing renewable generators more opportunities to sell into an expanded electricity market. The fate of the CAISO expansion is currently undecided and remains in the hands of the California legislature. The legislature can vote to implement an independent, expert-led CAISO board that would be on par with the boards of the other six regional ISOs around the country. The legislature decided not to take up the issue this year, but it will likely be on the political radar in California in 2018. Meantime, the Mountain West Transmission Group, which comprises parts of Colorado, Wyoming, South Dakota, and North Dakota, is considering joining another regional ISO—the Southwest Power Pool (based in Arkansas). This could potentially limit the ability of a future Western ISO to purchase low-cost wind from wind-rich areas like Wyoming and Colorado. While renewable energy-friendly companies and project developers might benefit from such an expansion, this is just one element in a complex discussion with many different stakeholders and perspectives. We would encourage businesses to investigate this issue and make their voices heard. As some of the most influential interstate Western institutions, businesses can play a leading role in influencing regional policy decisions. Some companies, for example, have already influenced state regulations by making access to renewable energy an important criterion in their investment decisions. Companies interested in joining this conversation can express their views through meetings with lawmakers, industry and consumer groups, and grid coalitions. With luck, these conversations will lead to a more efficient grid that encourages more renewables while taking into consideration perspectives of all stakeholders. This blog post was originally published on Rocky Mountain Institute’s RMI Outlet Blog and is part of a series from RMI’s Business Renewables Center (BRC), which streamlines and accelerates corporate purchasing of off-site, large-scale renewable energy.